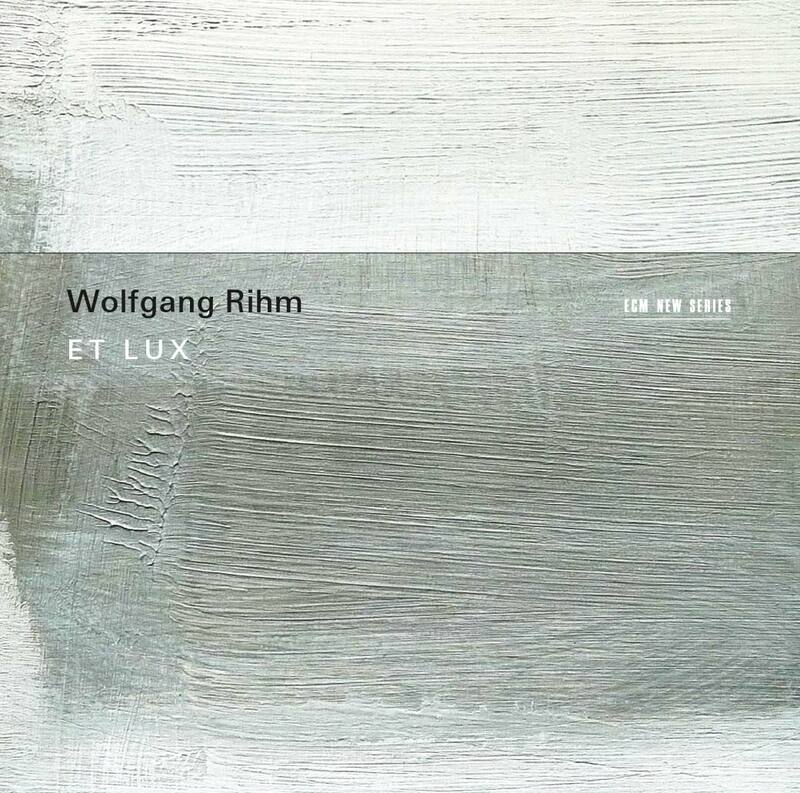 ET LUX is an hour-long composition for vocal ensemble and string quartet (2009) by Wolfgang Rihm that situates fragments of the Latin Requiem Mass in cells of sustained chords and spectral wanderlust. Although originally written with the Hilliard Ensemble and Arditti Quartet in mind, the performance here is in more than capable hands. The Minguet Quartett, approved interpreters of the composer’s string quartets, and the Huelgas Ensemble (which doubles the scored voices to eight) illuminate every fiber of this tapestry like sunlight through a castle window. For a composer so prolific (with over 400 works to his name), it’s only natural that again Rihm should cast once glance backward for every two forward, ending up suspended somewhere between the poles of question and answer, and proving them to be the event horizons of an arbitrary dichotomy. It is music that neither invites nor rejects, but places the listener (and composer) in a space where choices are the only true materiality. Hence the cellular nature of the piece, in which selective phrases serve as requiems unto themselves. As Paul Griffiths observes in the album’s liner text, “What we have here is not music remembered but music remembering.” Attribution of such sentience to notes on a page is no metaphorical trick. It speaks, on the surface, to the music’s body of antiquity and clothing of modernity, and beyond that to their entanglement among the bramble of performance and the flourishing of listening. In the manner of Alexander Knaifel, the instruments sing as much as the human voices. This, of course, requires a human touch. Still, the inner life of ET LUX is not provided but enhanced by that touch. The keyword, in both the writing and the playing, is “tactile,” as if both forces were bound by flesh and spirit alike. The quartet breathes, close to silence yet pregnant with words all the same, bringing its own voices to bear upon the passage of time. Each instrument must treat the space as it is treated: as an element of malformed crystal, whose light exists only for as long as it is uttered to be. The effect is such that, even when punctuating the darkness with spikes of pizzicato flash, harmonies merely disperse and regroup, taking on semblance of something newborn. An astonishing amount of variety pervades a work so slow-moving yet which bypasses pathos toward the development of deep, if sometimes tense, relationships. Moments approaching beauty are inevitably peeled away from expectation, leaving us to reckon with a more true-to-life distortion of textual fantasy. Instead of treating the Mass as a poem or liturgical given, it retraces shards of it until each is self-reckoning. The mystery of faith becomes a reflection of itself. As the piece goes on, the dynamic between voices and strings becomes mutually divergent, at once developing inward and outward. A prayerful mode gives way to fire, and further to snowy textures. Pulses emerge, morph, and overlap, but disclose little of their intentions. The clearest answer, then, is in the dark, sublime ending; a movement into new beginning, but in which direction is left open to interpretation.